Hi everyone! 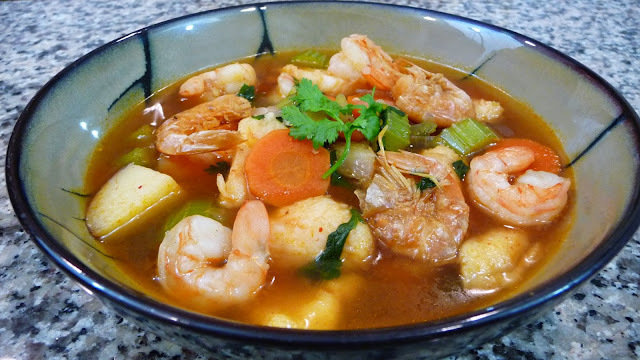 Today’s recipe is another of my Mom’s traditional Lent season recipes, it’s a delicious Shrimp Soup, it’s so easy to make and amazingly rich and flavorful that you will want to make it all year around! I hope you give it a try soon! Remove the stems and seeds from the Mirasol (Guajillo) Peppers. Place the peppers in a saucepan and cover them with enough water, bring them to a boil. Boil them for 5 minutes, and then place them in a blender with one cup of water and one cube o Shrimp bouillon seasoning. Blend until you get a smooth sauce, and set aside for a minute. Remove the heads from the dry shrimp. Set the shrimp aside for a minute. In a large saucepan, on medium heat, add a splash of olive oil and sautee the onion and garlic for 2 minutes. After 2 minutes add in the rest of the vegetables, (potatoes, celery and carrots) also add in the Bay leave and season the vegetables with salt and pepper to taste, cover the saucepan with a lid, and cook the vegetables for 5 minutes. After 5 minutes, add in the dry shrimp, and also add about 8-10 cups of water or Vegetable broth, (you need enough liquid to cover all the ingredients, so feel free to add more water if you need to). Cover with a lid a cook for about 15-20 minutes or until it boils. Let it boil for 5 minutes. After the broth has been boiling for 5 minutes, now strain in the red chili sauce, and add some fresh cilantro, cover the pan with a lid, and bring to a boil once again, boil it for 5 more minutes. After the broth has been boiling with the chilli sauce for 5 minutes, now taste the flavor add more salt and pepper if needed, also feel free to add another cube of Shrimp Bouillon seasoning if necessary. By now the dry shrimp should be completely hydrated and very soft and tender, so also taste one, just to make sure it’s tender, if you want the dry shrimp to be softer continue to cook the soup for another 3-5 more minutes and once you are happy with the shrimp texture, now add in the fresh shrimp and the fish, sprinkle a bit more cilantro and bring back to boil. Once the soup is boiling, you are ready to serve.